This is a block that aired on weekday afternoons between April 2004 and May 2007. It replaced Toonami when that block moved to Saturday nights. It was meant to be a more kid-friendly version of Toonami, which itself wasn't exactly kid-UNfriendly. 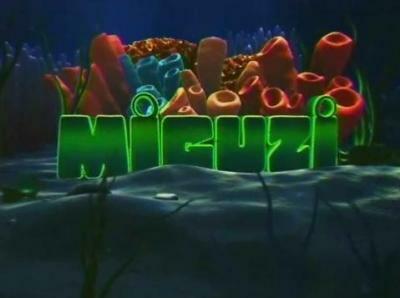 Miguzi was hosted by CGI girl named Erin (voiced by Jessica Di Cicco), who lived in some undersea station with various sea monsters. Or something. The block aired various animated series, some of which you can see listed on the sites I linked to above. I don't know if either of those lists include everything Miguzi aired, and I couldn't tell you for certain that everything they list definitely aired on Miguzi at all, but probably they all did. The thing is, Cartoon Network has always aired so many different shows (both Western animation and anime) at so many different times, in various blocks and at times that aren't a part of any block. I'd say many of the shows on Miguzi also aired on Toonami, or on Fridays, or on Saturday mornings, or just whenever. And some of the shows probably aired on other networks before they ever aired on Cartoon Network. So... yeah, I really don't remember what I watched on Miguzi (with the exception of "Code Lyoko" and probably "Yu-Gi-Oh! GX"), or whether I only saw some shows on Miguzi and no other time/place, or first saw them there, or never saw them there. And surely they had some things I didn't watch because I just wasn't interested in the first place, as well as things I didn't watch because I'd seen them before. (And for the last couple of years, I probably wouldn't have had the chance to watch Miguzi, anyway.) But whatever. It's a block I sometimes watched, and it was okay, though I would have preferred to just keep Toonami on weekday afternoons, I think. Honestly, I never saw the point of the change, since it really wasn't much of a change at all. Ben 10, Code Lyoko, Codename: Kids Next Door, The Life and Times of Juniper Lee, Megas XLR, Naruto, One Piece, Pokemon, The Powerpuff Girls, Rave Master, Static Shock, Teen Titans, Totally Spies!, Xiaolin Showdown, Yu-Gi-Oh! GX, Zatch Bell!